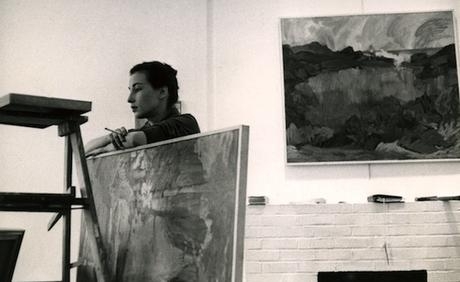 Jane Wilson, whose sixty-year career established her as one of the leading landscape painters of the postwar era, died on January 13, 2015 in New York. She was 90. Wilson’s most recent exhibition at DC Moore Gallery in New York in November of last year featured her luminous landscapes that hover between abstraction and representation, inspired by the sky, sea, and land of the East End of Long Island, New York. Her art is focused on events of the natural world—seasons of the year, times of day, and the many moods of the weather. Evoking these constant occurrences, Wilson directed her energies to making the most passing phenomena visible, to capturing the effects of shimmering light, heavy air, and passing thunderstorms. In many of her paintings, the sky, which can just as easily be taken as an abstract field of pattern and color, is anchored by the barest rudiments of recession and a low horizon that is a juncture of light and substance. Wilson was born on her family’s farm near Seymour, Iowa, in 1924. The flat lands, low horizons, rich earth, and big skies of her childhood formed the foundation of her vision as an artist. “As a child in Iowa, I was overwhelmed by the enormity of the unending space around me…. The land was vast. The sky was vast. Everything was vast. Growing up on a farm, you were continually made aware of the weather. And the weather was continually changing,” she once said. Wilson graduated from the University of Iowa with a B.A. and M.A. in 1947. After teaching art history there for two years, she moved to New York City with husband, journalist and photographer John Gruen. Settling into an apartment on West 12th Street, they soon immersed themselves in the downtown art scene. One day in 1952 at the Cedar Tavern, the bar made famous by the Abstract Expressionists who frequented it, Wilson was approached to be a co-founder of the legendary Hansa Gallery, an artists’ cooperative that was first on East 12th Street and later moved to Central Park South. Among the other original members were Jan Müller, Richard Stankiewicz, Wolf Kahn, Allan Kaprow, and Felix Pasilis. In all, Wilson had three solo shows at Hansa, in 1953, 1955, and 1957. She also participated in important group shows during these years, such as one in late 1952 at Tanager Gallery, another of the most active artists’ cooperatives, and in three annual exhibitions from 1953 to 1955 at the Stable Gallery on West 58th Street. In the mid-1950s, the Stable Annuals were major events that featured the work of both well-known and emerging artists, from Jackson Pollock and Willem de Kooning to Robert Rauschenberg and Helen Frankenthaler. The same year that she joined Hansa, Wilson began working full time as a showroom fashion model on Seventh Avenue in the Garment District, later becoming a freelance showroom and runway model. Artist friends and acquaintances questioned her choice, as modeling and its assumedly glamorous connotations were not in keeping with prevailing notions of what it meant to be a serious artist. In the male-dominated avant-garde art world, the hard-living Jackson Pollock persona reigned. She persisted nonetheless and gained some valuable insights from her work. “The handling of the material, mostly by European experts, the cutting and tailoring of drapery to your body, was fascinating, it had sculptural aspects,” she later recalled. In the mid-1950s, Wilson was working in an abstract expressionist style, creating paintings that resonated with the energy of the moment. Later in the decade, she shifted to expressionist landscapes. Among the many artists with whom she became friendly were Fairfield Porter, de Kooning, Jane Freilicher, and Larry Rivers. Porter, older and more established, became especially important to her, as his commitment to modernist representational painting supported her return to landscape painting. Wilson’s career as an artist began to take off in the early 1960s. The Museum of Modern Art acquired a large landscape, The Open Scene, in 1960, and Andy Warhol commissioned her to paint his portrait, Andy and Lilacs, which he subsequently donated to the Whitney Museum of American Art. That year, she also joined Tibor de Nagy Gallery, which represented several of her friends and other, mainly young painters, including Frankenthaler, Rivers, Freilicher, Porter, Grace Hartigan, and Nell Blaine. In 1964, Warhol chose her to be one of his Screen Tests and included her in his film The 13 Most Beautiful Women. By then, Wilson, Gruen, and their daughter, Julia Gruen, were living on East 10th Street, across from Tompkins Square Park, which led her to create atmospheric cityscapes of the park and surrounding neighborhood. She also painted the area around Water Mill, New York, on the East End of Long Island, where she and her husband purchased an old shingled carriage house in 1960. By the late 1960s, Wilson was focusing on still lifes set in her apartment and studio, including a group of behind-the-scenes paintings of worktables and artist materials. She exhibited with Graham Gallery, and later with Fischbach Gallery. She moved to the Upper West Side in 1968 and lived there for the rest of her life. Wilson returned to landscapes in the early 1980s, and began creating the distinctive works for which she is best known today. Her radiant paintings of the past three decades evoke the rhythms of the natural world, marked by constantly changing dynamics of everyday events of the sky. What I find so remarkable about confronting Jane Wilson’s paintings in the twenty-first century is how elegiac they look and how they simultaneously recall the poetic sensibilities of mid-century, when the syntax was kept simple, when everyday renditions of land and sky or ordinary life could be once benevolent and metaphysical – simple situations redolent of the vagaries and complexities of the day-to-day. The paintings are at the same time a “non-space,” an atmosphere in which we are lost, without perspective. The spectator is an observer, a navigator; the destination is drifting, like the clouds, and changing. Wilson received numerous awards and honors during her lifetime, from organizations such as the Louis Comfort Tiffany Foundation, Ingram Merrill Foundation, American Academy of Arts and Letters, National Academy of Design, and Guild Hall Museum. She was a visiting professor at colleges and universities across the country, including Parsons School of Design from 1973-83, and thirteen years at Columbia University School of Art, where she was Acting Chair from 1986-88. She was also a visiting artist and served on the Board of Governors of Skowhegan School of Painting and Sculpture, Maine from 1981-1990. Her paintings are in many museum collections, including those of the Museum of Modern Art, Metropolitan Museum of Art, Whitney Museum of American Art, Hirshhorn Museum and Sculpture Garden, Art Institute of Chicago, and San Francisco Museum of Modern Art. Jane Wilson is survived by her husband of sixty-seven years, the photographer and writer John Gruen, and their daughter, Julia Gruen, executive director of the Keith Haring Foundation.